A creative flow of asanas linking movement and breath. This morning class is a perfect start to your day. It will open up the body, free the mind whilst helping to stretch and tone the body. Mysore Style enables you to work at your own pace with your own breath thus enabling a deeper yoga practice. 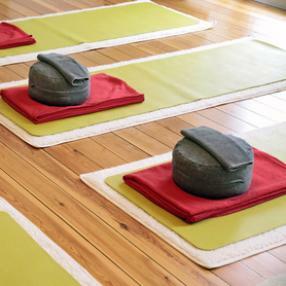 In a Mysore style class you work one to one with the teacher within a group setting. Start when it suits you, allowing at least an hour for your practice. Hot Rocket is a cross between Ashtanga and Vinyasa, and is noted as the original ‘Power Yoga’. Developed by Larry Schultz in 1980s San Francisco, the style is expected to keep you moving faster and more fluidly than a typical hot yoga class. While you might miss a few of the sequences in the first sessions, you will quickly catch on by the third or fourth. Classes are regularly booked, so book early. Knowledge of Sun Salutation's is recommended, but modifications will be made. Room is heated. A strong practice with an opportunity to explore your potential and build the confidence to take your practice to the next level. Inversions, arm balances and backbends will be included in every class. Emphasis on core strength - be prepared to work hard.